In September 2013, I celebrated my 50th birthday, my gift to myself was this Graflex 1a from Ebay, costing me £64, the funds being the last of the Google income. 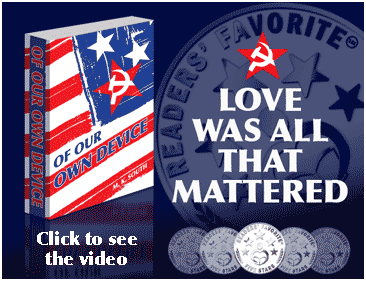 It was a bit too much to pay if I am honest with myself, as it was advertised as non working, and there was no way to ascertain just what the problems would be. The leather panel from the front was missing, a sure sign of tampering, as this conceals the mounting screws for the front panel. Since it doesn't actually have to be removed to gain access to the shutter or mirror mechanisms, it's a good indication that someone had a go who didn't know what they were up to. On arrival the camera was given a brief external clean then photographed before disturbing anything. The most obvious cosmetic issues were the missing leather panel, badly damaged focus hood, missing autographic stylus and retaining bracket. Mechanically, the shutter was partially releasing, but the mirror would not retract. The good news was that the slits in the shutter curtain were parallel, suggesting it was still intact and the lens, whilst filthy looked serviceable. Generally the leather was in reasonable shape too, the bellows were still intact. Both rear hatch catches were broken off, a weak spot with this particular model. Rather than dive in, I spent a few evenings just turning it over and examining the thing. Planning how I would go about each stage. The first thing to decide was how it was to look when finished. Very early on, this camera spoke to me, each camera has a tale to tell. 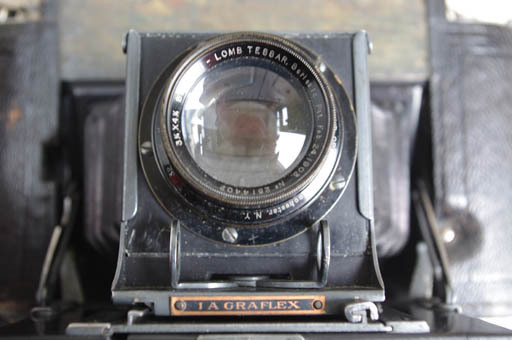 This Graflex 1a has seen an enormous amount of use, it's very apparent from the rubbing and wear patterns that it's been used a lot. I decided that this evidence needed to be preserved and so, this camera was going to be more conservation than restoration. With that decision made, it was a case of working out repairs so most of the original would be retained. At left is the sprung panel from the trestle strut supported focus hood. In it's own right, this is an interesting component, only found on the early Graflex 1a, it was superseded by a simpler and shorter, unsupported assembly in 1917. This was relatively simple task to clean then glue back the covering, with a little strip to reinforce the weakened areas. The somewhat overbuilt hinge tongue that doubles as the cover for the lens bed release out to have a leather covering applied, but was missing. There is no real need to remove the cover for most repairs to the mirror box or shutter, but it does make things a little less cumbersome once removed. Since the leather was already missing, there was no harm in removing the hinge panel and cleaning everything beneath. The leather panel presents no real problem as it's only decorated with a simple box rules. The rules can be put in with the method described in Project 3. The rounded ends are formed with rolled aluminium plate, covered in leather. As is common practice, the leather is stuck over the untreated aluminium. The aluminium had corroded due to chemical reactions with the water solubale glue used and exposure to moisture.The thick layer of oxide dries out and shrinks the leather covering. This oxide would need to be removed, the leather panels cleaned and then put back. Moving onto the right hand top plate as first delivered. Beneath this plate is the shutter release mechanism. Also this side determines the size of the slit that will sweep the film plane. 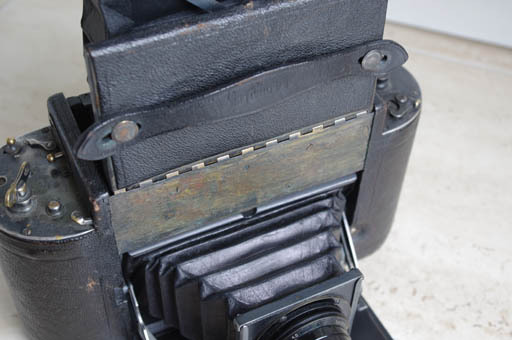 The Graflex shutter curtain consists of a very long blind with five slits from full frame to one eighth of an inch. The small round window is where you read out the size of the slit that will next sweep the film. The pointer indicates whether or not the camera is set to Instantaneous or Timed exposure and shares the pivot with the shutter release mechanism beneath, triggered by the retraction of the mirror. 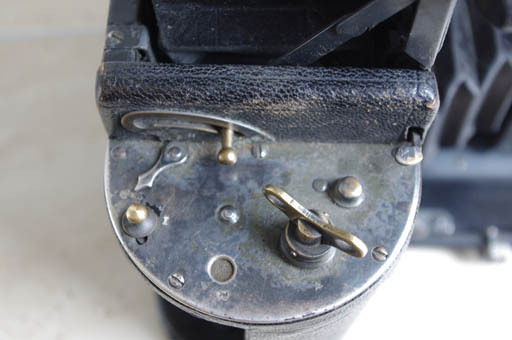 The key is used to set the shutter curtain slit. The raised boss above and to the right of the key is the top bearing cover for the shutter curtain roller. The knob at the tip of the pointer is used to release the shutter curtain if wound past the slit you require. In theory, a lock prevents this from happening unless the mirror is in the down position. The lever protruding from the slot above the pointer is the mirror setting lever. The mirror needs to be manually reset after each exposure, and a lock prevents the shutter from being moved until the mirror is set again. Finally, the small lever near the front, is the lens bed release. At the opposite end is the plate that covers the shutter tension and take up roller. The shutter is tensioned using the key, and the degree of tension is read off from the small round window, from 1 to 6, 1 being the least. 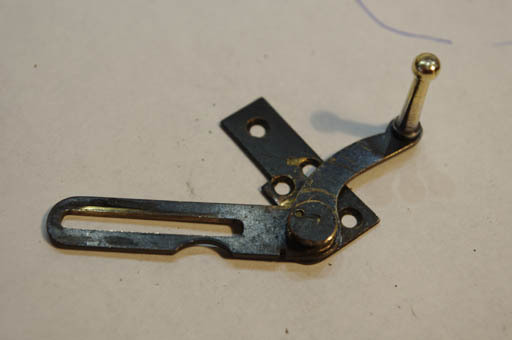 The escapement lever is used to back off the tension if required. 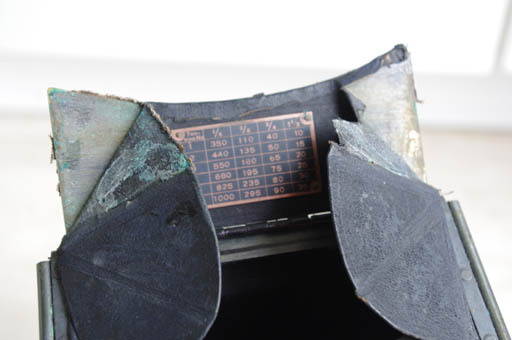 The shutter speed achieved is a function of tension and slit size, and a neat metal guide table riveted in the viewfinder hood gives the result. 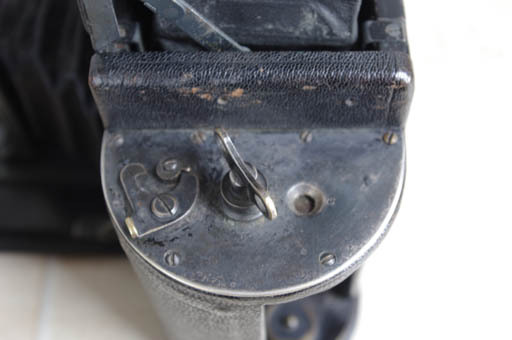 These early Graflex 1s have the ratchet mechanism on the outside. The sprocket is delightfully crude, clearly being formed by hand, and retained by an off centre drilling, coarsely tapped to accept a small tapered screw. To gain access the sprocket needs to be removed, by removing the grub screw then the sprocket itself is screwed off the shaft of the take up roller beneath, which will then spin off any remaining tension. There is no need to dismantle the key or remove the escapement lever, unless you really want to clean it up. Looking at the wear, I decided to clean but leave the patina as it is. 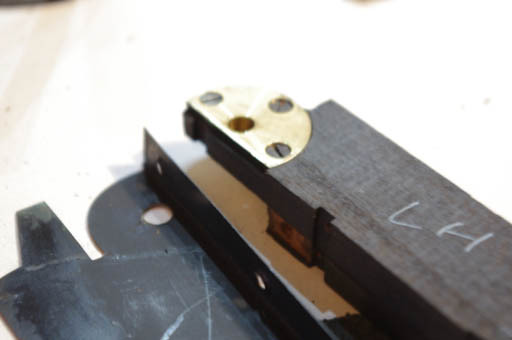 The carcass shows the witness marks and screw holes for where the Autographic Stylus brass bracket once was. The top plate screws show a small amount of evidence of prior tampering or maintenance, but nothing too clumsy. 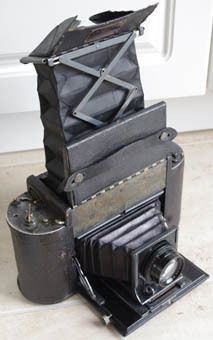 The Bausch and Lomb license produced Tessar, no mention of Zeiss. 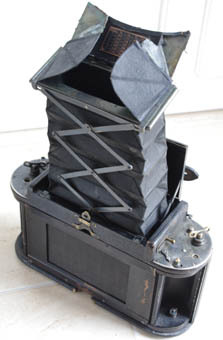 The first World War had started the year prior to this camera being made, and although the USA was still out of it at this stage, maybe they thought better of it. The small x scratched into the case is evidence of an earlier camera technician's work, although normally they'd be a bit more discrete. The lens has been cleaned off here and looks in good shape. The serial is 2514402. There are no issues with this part of the camera, a good clean is all it needs. 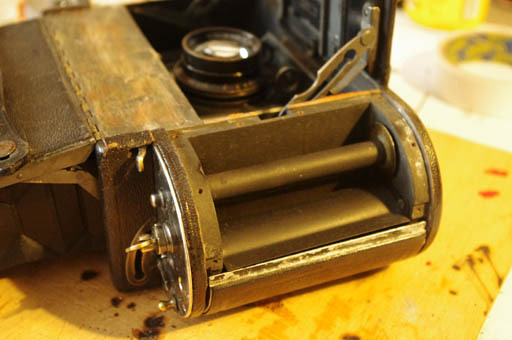 Nothing untoward here, a bit of wear and abrasion from countless films being run through it, one missing screw from the lower catch, and some buckling of the, rather flimsy, film plane plate. 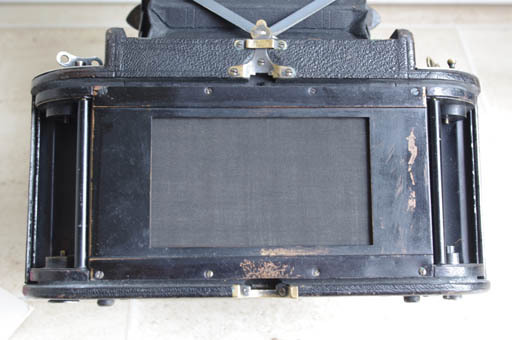 There is no film pressure plate and the autographic hatch is the sliding type. 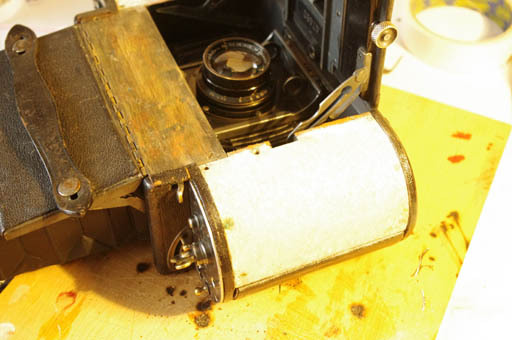 So, having given the Graflex a thorough external survey, I like to start, quite literally, with a clean sheet of paper. A fresh sheet of A1 layout paper goes on the bench and I pull the thing to pieces. I photograph as I go, and make notes onto the paper, collect screws together and annotate them as they come out. 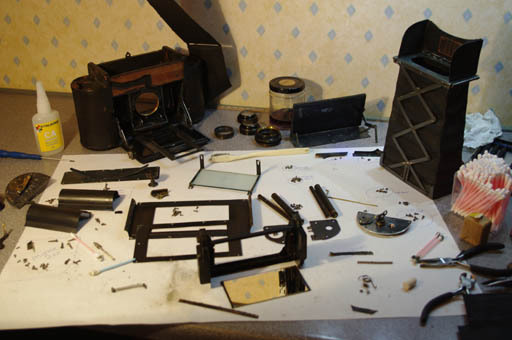 Here the Graflex is now pretty much disassembled. By this point it had become apparent just how much use this camera has endured. The shutter curtain was covered in ancient repairs and the mirror box springs had broken, at least once before the current set had, as the ones fitted were very poorly made replacements. I decided to save the shutter curtain so further repaired one tear that was developing. This was a pragmatic choice, originality over function. The curtain has so many historic repairs it makes a larger diameter as it winds in, so that the narrowest slit can no longer be used as too much curtain is advanced for the final winds and the curtain draws taught prior to the last setting catch engaging. But I felt that the contemporary repairs are part of this camera's story and charm, and should be conserved. This is the underside of the shutter setting plate. This was very gummed up with filth and dried grease. Before cleaning several scratch indicator marks were discovered. I added a few more of my own, then the whole assembly was tumbled in a bath of Methylated spirit. 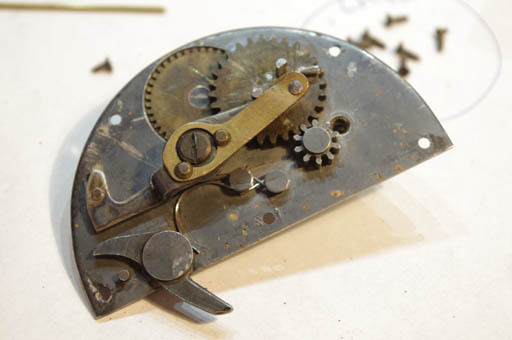 The gears are riveted to their shafts, so this was the best way to deep clean the mechanism, only the setting lever and spring could easily be removed. This spring was also non original and was replaced. The spring curling around onto the release lever (bottom left) acts as a brake. This lever is actuated by the mirror, as it is pushed backward by the retracting mirror, the other end trips the shutter. The Shutter escapement wheel is also very obviously hand filed, from new. 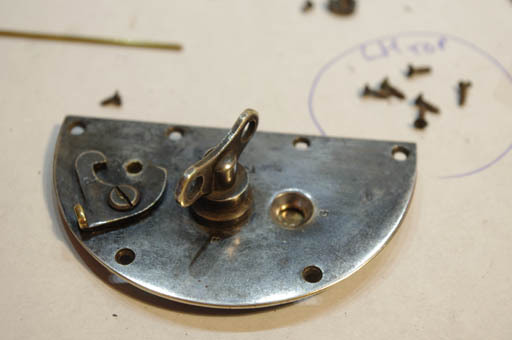 This image shows the mechanism after cleaning. This is the left hand top plate after cleaning, no attempt was made to refinish the part, just clean off the muck then put it all back together, It wasn't polished, the bright appearance came about naturally from the shear amount of handling it received and the tumble bath treatment. The key was dismantled this end, out of curiosity to discover the construction technique. Overly complicated is my conclusion! This innocuous looking part is rather critical. This is the mirror setting lever (screwed back on backwards, just so it didn't get lost) and the retraction spring pivot and lifting arm. In service, this part is under a fair amount of strain, hence the four screws to keep it stable. It should have a fairly hefty spring, but the original had long broken and been replaced by a rather grim and distinctly un-elastic coil of nastiness. The wear from use is readily apparent on the slot. The aforementioned coil of nastiness that was masquerading as a retraction spring. Along with the remnants of the left hand retraction spring. When working the larger spring starts the mirror box moving, the left hand spring comes into full effect as the mirror reaches halfway, providing further inertia to trigger the shutter. This spring had suffered from damp and had rotted away to powder in places, this was all that remained of it. 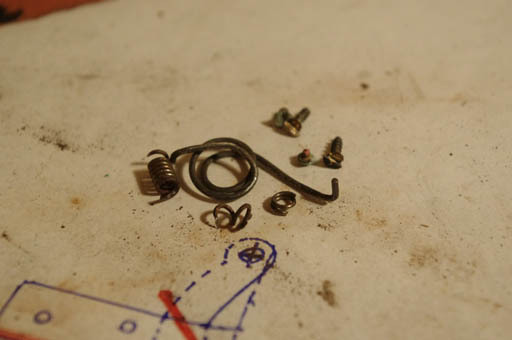 This small collection of springs and screws are the few that could not be saved. So this represents the only parts that were not put back, everything else was salvaged. This is one of my impromptu drawings I made on the sheet and is my first solution for a replacement spring. In the end I discarded this idea and went for the right hand drawing, this makes use of one of the original anchor points and the dog leg allows the spring tension to be adjusted for fine tuning, this was the method employed and works very nicely. The mirror box was taken apart completely to allow the mirror to be thoroughly cleaned and the pivots serviced. This is the left hand pivot after cleaning and about to go back together. As you can see, construction is mixed, with a wooden frame mounting a plain brass bearing and thin sheet steel light baffles. The whole assembly is relatively heavy, not least due to the size of the mirror and metal mirror frame. This in turn means that the retraction springs need to be fairly beefy. The disadvantage is the acceleration needed get these assemblies moving and subsequent inertia means that the camera moves appreciably during release. 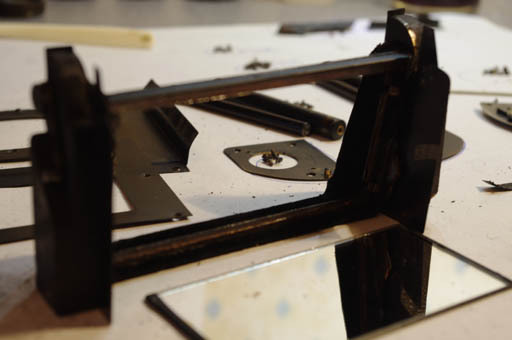 The rather weighty mirror box is seen here during assembly, with the cleaned mirror ready to go back in. The mirror is back silvered rather than surface silvered which would become standard in later SLRs to avoid double reflections. But the good news is that back silvered mirrors are much less susceptible to damage, and this mirror went back in after just a good clean. This is the heavily oxidized aluminium end, after the leather covering had been encouraged to drop off. This was also a pragmatic decision, the leather was cut at the junction with the wooden carcass. The glue was still holding tight on the wooden sections, and was unlikely to come away without damaging it. This cutting solution would result is a thin easily disguised cut and allow the skin to be treated and put back afterwards. Removing the plate gives access to the shutter curtain. If the shutter curtain needs to be removed completely, this is the only way it will come out. The curtain in this image is fully wound onto the the take up roller at the other end. This shows the other end with the curtain fully wound in, showing just how little room remains. Any significant dents in the aluminium covers will effectively jam the shutter by acting as a brake. 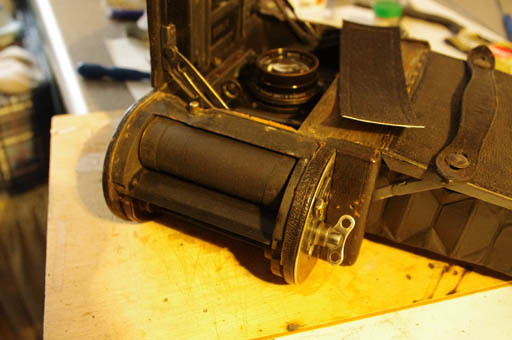 This shot was taken as the Graflex was going back together, you can see the newly made leather front panel complete with ruling, about to be stuck in place. 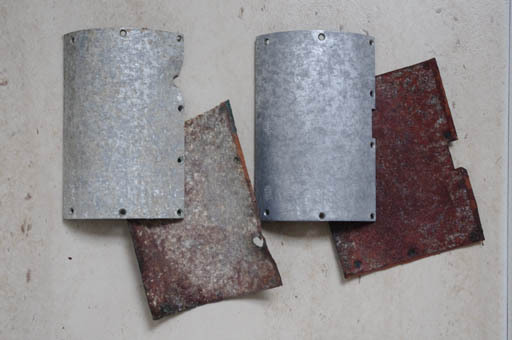 Here we see the aluminium end plates and leather coverings, the left hand pair are untreated, whilst the right hand pair have. Even so, you can see the degree of pitting that remains, however it serves as a good key for the new glue. The leather was treated only with distilled water, and the old glue scraped off. This isn't as harsh as it seems, this piece of leather was treated much harder during manufacture and a good soaking and scraping stretches and restores the dimensions. When it went back on it had returned to the original size nicely and now there are no unsightly gaps. 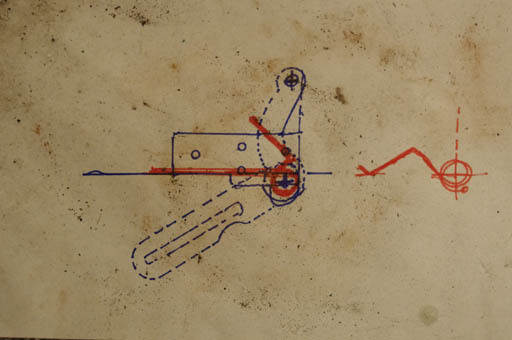 The autographic stylus bracket was made up using refrence photographs and the witness marks of the orginal, and a stylus from the box of spare parts was inserted. Not visible in this view. First impressions are, it's a beast. And the thing is impossible to keep still, hand held. The mirror box is so heavy that the camera rocks noticeably as the mirror accelerates from stationary. Only to rock the other way as it slams into the shutter release mechanism, which in turn accelerates nearly four feet of shutter curtain from a standing start, resulting in a noticeable sideways deflection. The noise this all makes is fantastic, and the crescendo is delivered with that classic "fwop" that only a large cloth blind shutter can make as it's abruptly halted. The noise is as recognizable in this very early generation Graflex as it is on much later and refined SLRs.